Successful gene profiling studies involve careful experimental design, use of sensitive and accurate technologies, and statistically valid analysis of experimental results. 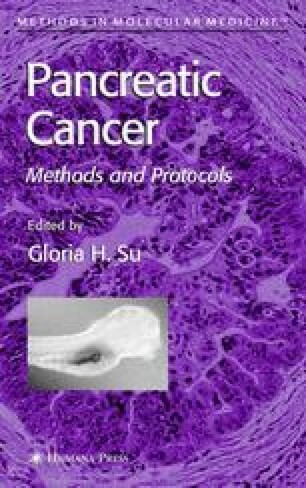 In this chapter we describe our approach to the profiling of pancreatic adenocarcinoma to illustrate the various steps and methods involved in this type of study. Pancreatic adenocarcinoma is a particularly challenging subject for gene profiling, as these tumors have a profound desmoplastic response such that neoplastic epithelium makes up only a small proportion of the tissue mass. We have utilized statistical comparisons of gene expression between adenocarcinoma, normal pancreas, samples of chronic pancreatitis, and pancreatic cancer cell lines that provides a means to deduct the influence of the stromal elements. We utilized oligonucleotide-directed gene chips (Affymetrix), as they allow the simultaneous interrogation of thousands of genes in an efficient, reproducible, sensitive, and highly quantitative manner. The details of the approach we utilized are reported here, including information on experimental design, sample collection, expression level measurements, and data analysis for gene profiling.